Aspen Club Members from left, Uwe Pahlen, Helene Pahlen and Jo Vincelli, enjoy a moment during a recent Aspen Club event at UCHealth Longs Peak Hospital. Photo by Joel Blocker, for UCHealth. Uwe Pahlen looks forward to his UCHealth Aspen Club bimonthly newsletter arriving in his mailbox. In the latest edition, a Longmont class caught his eye. Pahlen and his wife live in Loveland and joined the Aspen Club in 2015. 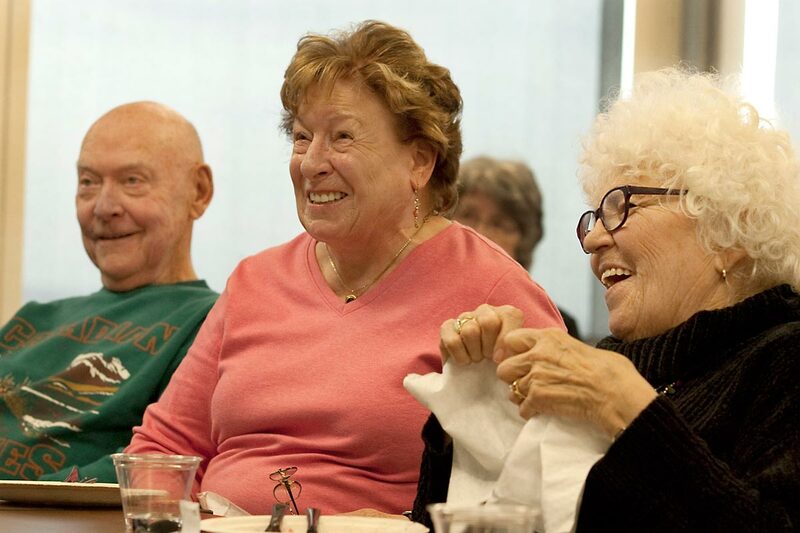 The club originated 30 years ago in Fort Collins as part of an effort by leaders at UCHealth Poudre Valley Hospital to support healthy aging for those 50 and older. It later expanded to Loveland, Greeley, and Windsor, and most recently, Longmont. The club is free to join, as are most of its programs and events. 2–4:30 p.m. Friday, May 10, Platte River Fort, east of Greeley. Join us for a special meet-and-greet at this fun western-themed event center. Enjoy the music of Brad Fitch — one of the best John Denver tribute artists in the nation and meet Marilyn Schock, president of the new UCHealth Greeley Hospital. 4–6 p.m. Wednesday, May 29, Sweetheart Winery, 5500 W. US 34, in Loveland. Join us for a celebratory gathering featuring well-known local sculptor, George Walbye. George’s work is on permanent display in nationally renowned Benson Park Sculpture Garden, and his bronzes are in private collections throughout Europe, Canada and the United States. 3-5 p.m., Saturday, Aug. 3, Lincoln Center, 417 W. Magnolia, in Fort Collins. Meet Maestro David Dworkin. After a distinguished career as a widely-hailed clarinetist and conductor, he took his passion for classical music and transitioned it into an innovative, award-winning and healthful program called, “Conductorcise.” Participants will experience a symphony performance, music history lesson and a fun “conducting” activity all rolled up into one. *This event also takes place in Longmont during the Boulder County Fair. Look for an update on the time, date and specific location at uchealth.org or in the Aspen Club newsletter. 5-8 p.m. Friday, Dec. 6, Lincoln Center, 417 W. Magnolia in Fort Collins. Dr. Brad Nieder is a funny speaker and clean comedian who has been described as “Jerry Seinfeld with an MD.” Have fun as you learn why laughter really is good medicine for combating stress, feeling better and living longer. There is a cost for this event as it is in conjunction with the Aspen Club’s annual holiday gala. 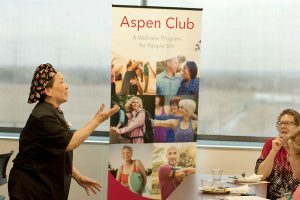 Aspen club offers an array of health, education and fitness programs and screenings to its members (and free membership) throughout northern Colorado. To see what you might benefit from or to sign up for an event, visit uchealth.org/aspenclub or call 970.495.8560. Rita Gee, head chef at UCHealth Longs Peak Hospital, discusses healthy eating habits to Aspen Club members at a recent event. Photo by Joel Blocker, for UCHealth. 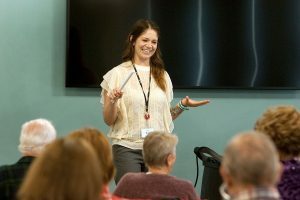 Pahlen was among about 30 people who recently gathered at UCHealth Longs Peak Hospital conference room for the hospital’s first Aspen Club program: Smart Foods for Strong Brains. Katie Johnson, who recently joined the Longmont Aspen Club, was there too. “They gave us some good ideas on how to incorporate different nutritional ideas into our diets, such as fruits and nuts,” she explained. 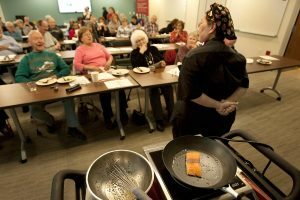 Participants enjoyed a brain-healthy lunch — of grilled-salmon salad — and cooking tips by the hospital’s chef. A hospital registered dietitian also talked about “smart” food choices. While the camaraderie and nutritional programs are great, Pahlen also says the club is his go-to source for trusted health advice. “If I ever have a problem or question, I call the Aspen Club, and they guide me to the right thing — they are first in line for someone I’d contact,” he said. The Longmont club already has a half-dozen events and classes scheduled, said Julie Adams, manager of the Aspen Club and volunteer services at Longs Peak Hospital. And the club continues to add to its schedule. UCHealth Aspen Club has about 13,000 members throughout northern Colorado. Services include everything from Medicare help to health screenings, heart health classes and yoga for back pain — and everything in between. Adams said while the club is growing, they are trying to offer an array of programs to fit the different needs of its new members. Already scheduled are an informational talk on strokes from a UCHealth neurologist, a cycling program to help people get started, and an informational session on medical advancements, treatments and activities for arthritis. They also plan to provide such opportunities as medication reviews and smoking cessation. Learn more about the Aspen Club in your area at uchealth.org/aspenclub. Joining is free, and orientation sessions for new members are held regularly. Applications are available online, at the hospital, or through the mail. Is it a springtime allergy or cold?